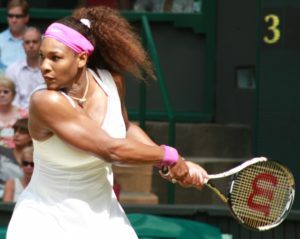 Tennis elbow, or lateral epicondylitis, is a common type of overuse injury affecting the extensor tendon at the elbow and muscles attaching to that tendon. Repetitive use of the forearm extensor muscles (these are located on the hairy side of your arm) pull on this tendon and can produce tiny tears in the fibres, leading to inflammation and pain. 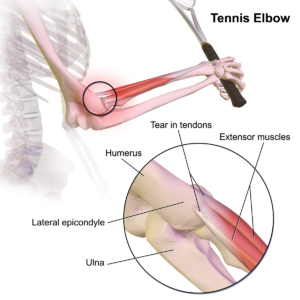 It’s named ‘tennis elbow’ as these extensor muscles are used in a backhand tennis swing and many tennis players experience this injury. But tennis is just one of many activities that can lead to the condition, anything involving repetitive arm motions can contribute to the problem. The condition typically presents as pain on the outside of the elbow that is worsened with movement. Certain motions such as rotation will cause pain, therefore, opening doors or using keys may be an issue. The pain can also radiate down into the forearm and hand once the surrounding muscles become hypertonic and develop trigger points. You may even feel some heat and swelling at the site of the pain, along with tight muscles in the forearm. The good news is this condition is totally treatable without pain killers and anti-inflammatories! A combination of massage, ice, stretches and simple strengthening exercises can significantly ease the symptoms and get your elbow back to a pain-free state! First, the elbow MUST be rested. If a sport or hobby has caused the condition it’s important to take time off and let the tendon heal. If you can’t take time off, if it’s your occupation for example, you should try to take regular breaks during repetitive tasks, or switch up your equipment if you can. Wearing an elbow brace is also a good idea and can be purchased from most pharmacies. Applying ice to the area after aggravating activity will help ease the pain, for more info about how to apply ice head to this blog post. Massage can help by decreasing the tension in the forearm muscles and treating any trigger points that may be contributing to your pain. Certain techniques can also focus on the tendon itself, increasing circulation to the area and promoting healing of the damaged tissue. 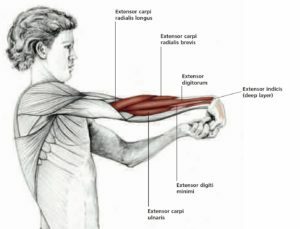 Stretching the extensor muscles prior to activity can help ease tight muscles and prevent further damage. To do this you must extend your arm out in front of you with your palm facing down. Keeping the elbow straight, pull your hand down with your other hand until you feel a stretching sensation along the top of your forearm. Find a position that produces a stretch but isn’t intense enough to produce pain – stretches should never be painful! Hold the stretch for 30 seconds and repeat with the other arm. If you’re suffering with this condition and would like further information feel free to reach out to me, and if you’re looking for a drug-free treatment plan consider massage therapy as an effective option.